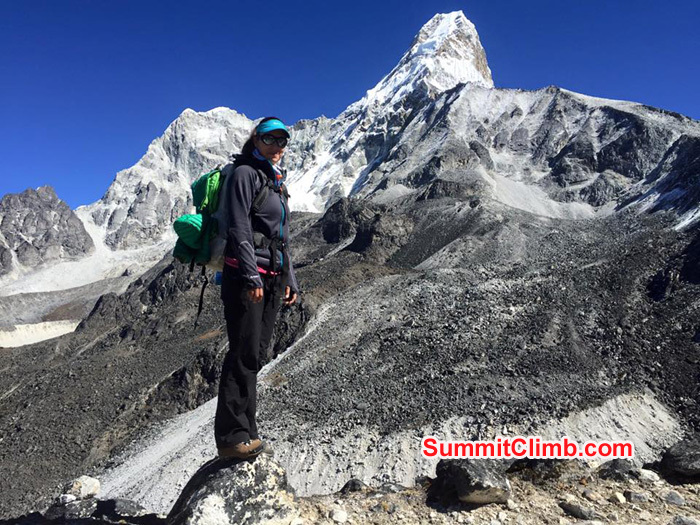 News from Ama Dablam Expedition, Island Peak and Everest Basecamp Trek. 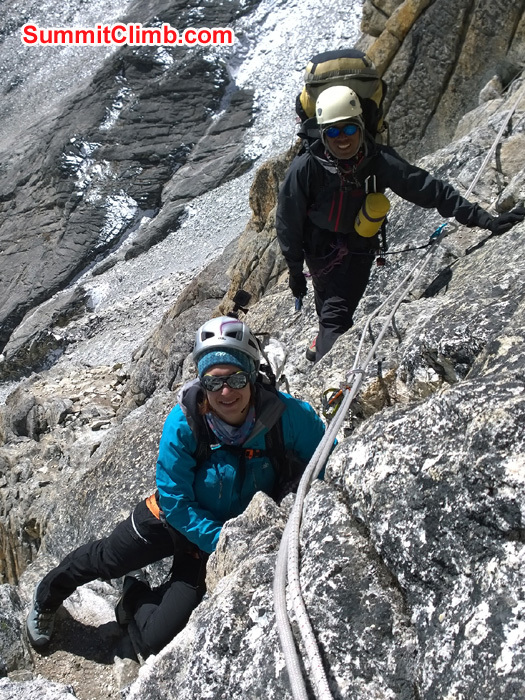 Update from Expedition Leader : Monica & sam are now back at BC after a very long climb/trek from C2. Well done!! Update from Expedition Leader :Shlomo & Yeoram are now on there way from BC to C1 for two days. Monica & Sam are today slowly making there way back to BC from C2. Congratulations to Monika & Sam who reached the summit today at around 12.30. Gian & Pascal are now down at BC after a fantastic summit. both are v/tired but feeling great. 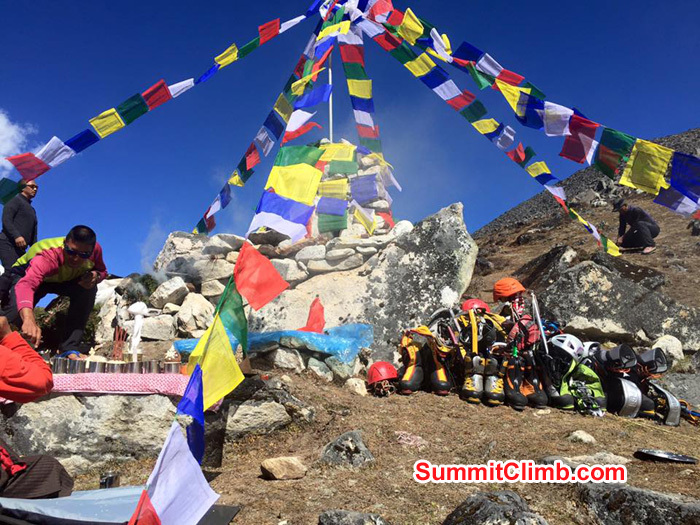 Today at around 12.30pm Pascal Gian & Pasang Sherpa reached the summit, all heading back to C2. 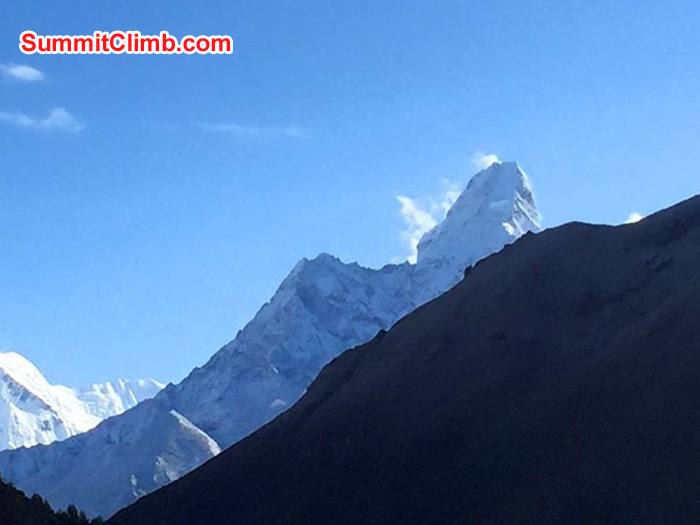 Update from Dan Mazur : Just heard over the walkie talkie 2 more members of our Ama Dablam team SUMMITED. 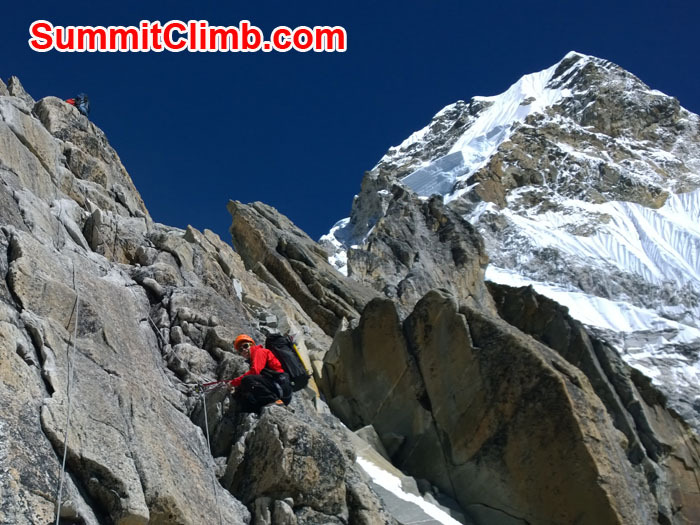 Update from Expedition Leader : Monika & Samuel have now gone from C1 to C2 & are going for a summit bid tonight. Working on Yellow Tower to reach Camp 2. Photo Pascal. Shlomo is now at ABC & looking to stay the night & then going to try & tag C1 tomorrow. 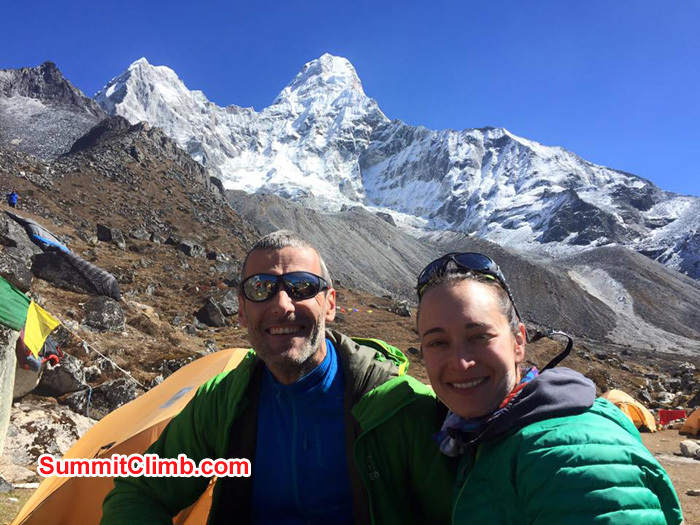 Monika & Samuel have now gone to C1 for the night & then considering going to C2 tomorrow & a summit bid that night. 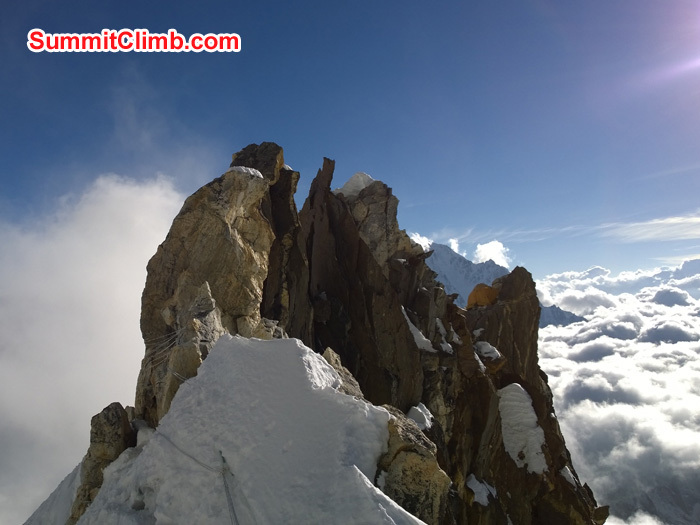 Pascal & Gian are still at C2 & waiting for a weather window for a summit bid. Update from Expedition Leader : The whole team is now down safe & back at BC. 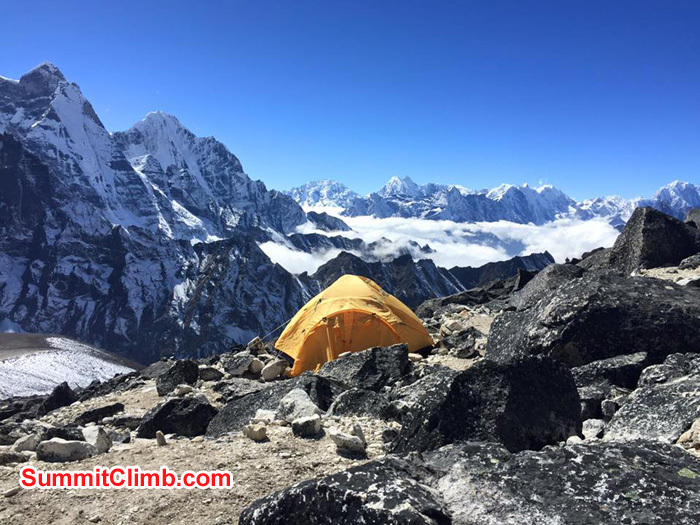 Update from Dan Mazur : Just had a ‪walkie‬ talkie conversation with ‪‎Ama‬ Dablam group 2, who are in camp 2 @ 6000m/20,000ft. Steady ‪snowfall‬, retreating to camp 1. 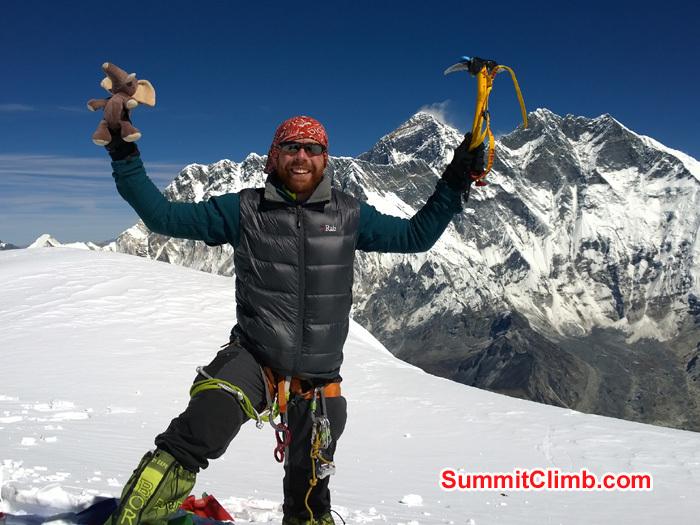 Pascal, Gian & Rayk are at C2 and are going for a summit bid tonight. Summit Photo. Felix and Rob. 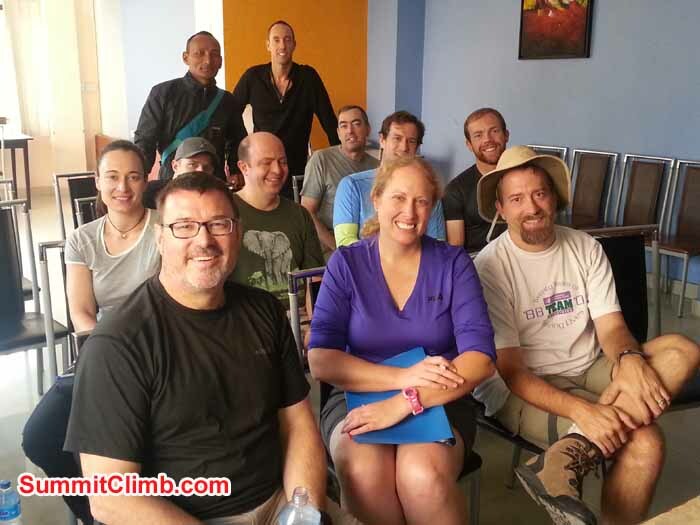 Update from Expedition Leader : First Team Summit. Congratulation. 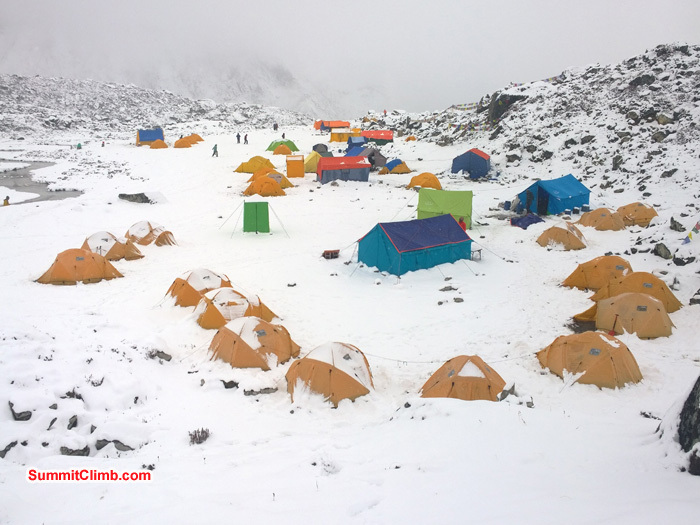 Update from Expedition Leader : Tim, Felix,Jessica & Rob are now at C2 and resting before there summit bid tonight. 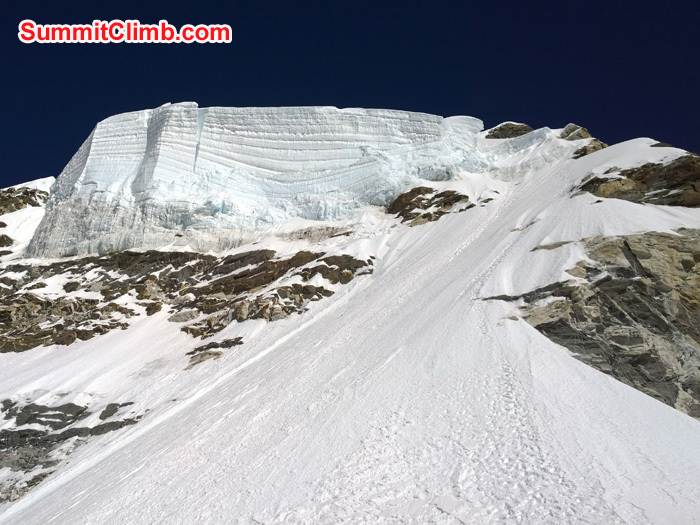 Update from Expedition Leader : Jessica, Tim, Rob & Felix are resting at C1 today & moving to C2 & summit bid tomorrow night. Way to Dablam. Camp 2. Photo Rob. Dablam . Photo Rayk. Yellow Tower. Photo Rob. At Camp 2 and 1. Photo Rayk. All members are now at C1 and tucked up in there sleeping bags after a hard day getting here from BC. 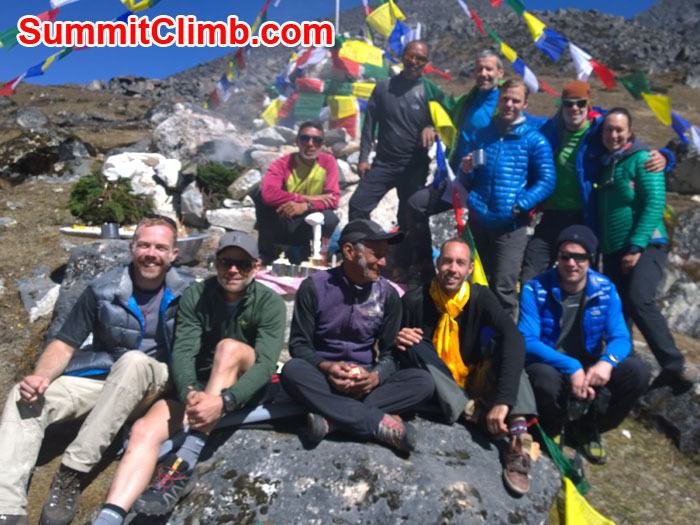 Today was a rest day for most of the team and they took the opportunity to visit Pangboche. 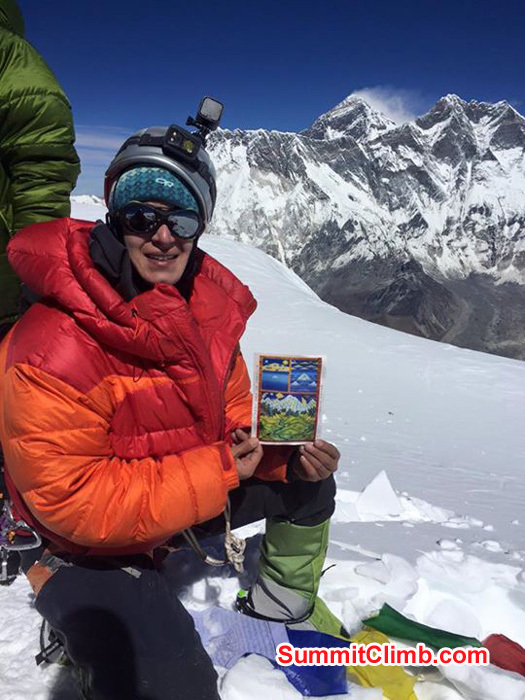 Update from Expedition Leader : This afternoon all members went on an acclimatisation hike from 4600m up to 5003m. This morning has been spent doing rope work and mountain skills training. Night with light in AmaDablam Base camp. Horse at AmaDablam Basecamp. Photo Rayk. At Pangboche Lama Gasi. Photo Jessica. At AmaDablam Basecamp in Sunny day. Photo Rayk. Group Photo at Basecamp. Snow day in Basecamp. Photo Rob. 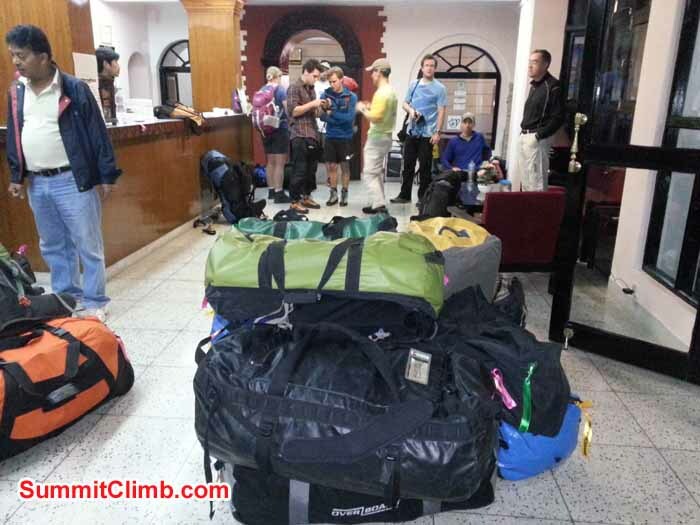 Update from Expedition Leader : Today has been a rest and gear check day, all members feeling great. Update from Expedition Leader : We have now reached BC, All members are feeling OK and now resting. Getting Blessing from Pangboche lama. Photo Felix. Photo taken in Night. Photo Rayk. 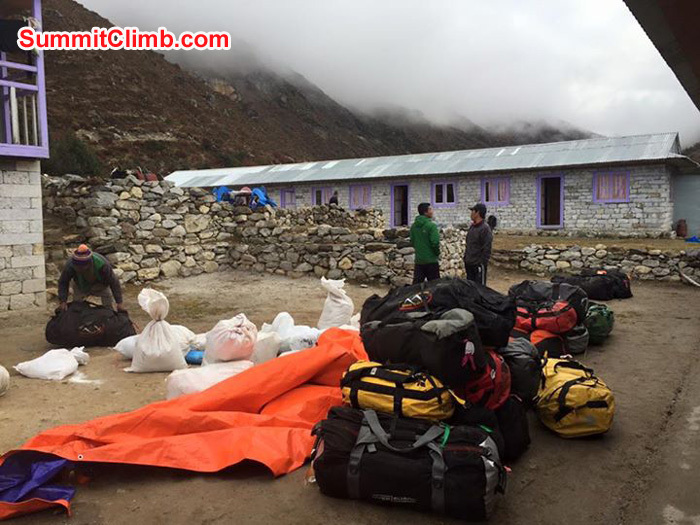 At Pangboche, Staff preparing load for basecamp. Photo Jessica. At Tangboche Monastary. Photo Felix. 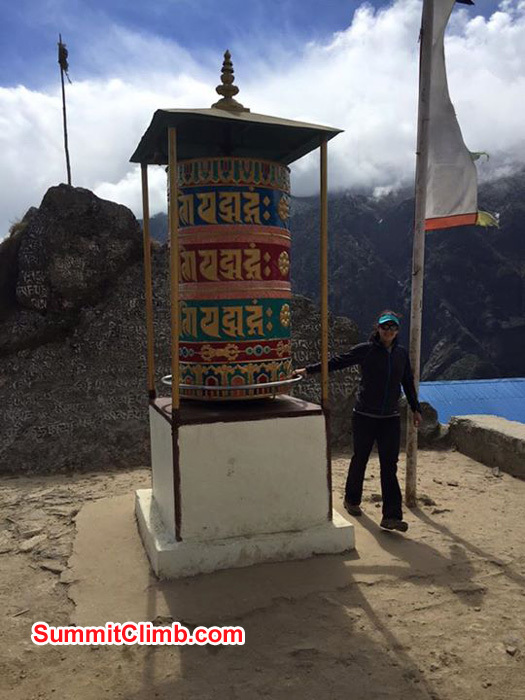 Update from Expedition Leader : We had a beautiful walk from Namche to Pangboche all members are doing great. Hiking in the Khumbu Valley. Photo Rayk. Acclimatizing in Namche Bazaar before the next leg to base camp. 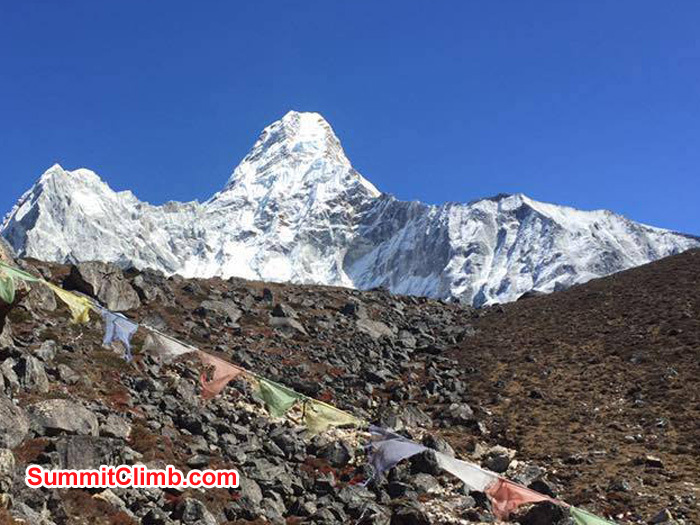 Tomorrow should bring the first glimpse of AmaDablam in all it's glory. I can't wait for that moment. Photo Jessica . AmaDablam in Close Up. Photo Rayk. Namche Bazaar. Photo Rayk. Climber Statue. Jokiyo at Namche. Photo Pascal. One of the suspension bridge. Photo Pascal At Shoyambhu Nath. Photo Daniel.